Rated 5 out of 5 by catnip5 from Beautiful! Only Elephant Games could produce such a beautiful Christmas story. The story line, the art work, the music are all exceptional. It also stays true to the real meaning of Christmas. Well done, Elephant Games! Rated 5 out of 5 by peacelilly47 from Heartwarming!! WOW just finished with tears. What a wonderful seasonal game. True spirit and meaning of Christmas without all the silly Santa stuff. It's a winner for me. Rated 5 out of 5 by canaduck from Glad I bought it! Lovely Christmassy graphics and a really nice variety of different kinds of puzzles. Rated 5 out of 5 by oldladywho from Diverse HOGs! I liked this game because it had a non-gorey bad guy(gal) instead of the very dark villains that seem to be popular. Graphics were great and the storyline was consistent. The HOGs ranged from outlines to image unlocking items to regular list items. As a casual player, I did have to skip a few puzzles that I could not complete but this is due to my lack of experience and skill on these games. Luckily, the skip, map and even two different helpers are available! It was shorter than I had hoped as I really enjoyed it! Rated 5 out of 5 by BooksandGameFan from Lots of fun for Christmas! I purchased this game last year but since it was after Christmas I thought I'd hold on to it and play it this Christmas. Well, I just played it and I really, really enjoyed it! 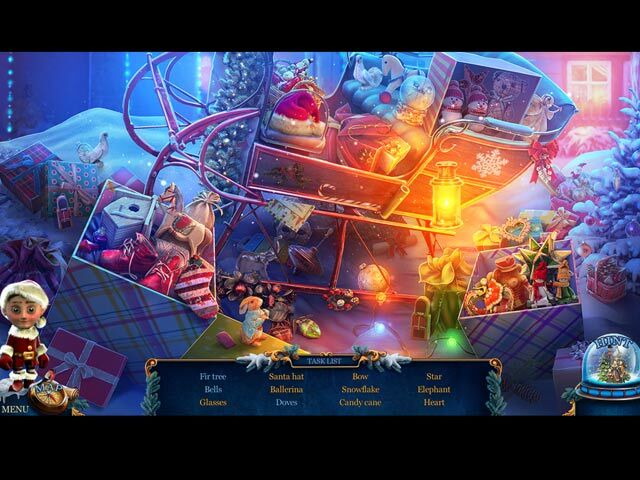 The scenes were very Christmasy, the music was pleasant, the games and hidden object scenes were fun and creative but best of all the story was wonderful and had a perfect theme for this time of year! Helping others!!!! I liked this game way more than the new one out this year, that game I'm sorry to say I don't find very Christmasy at all. Other great Holiday games I recommend are Tin Soldier, and Puss and Boots, I don't recommend the Nutcracker. I'm so glad I purchased this game and can't wait to play it again! Rated 5 out of 5 by denniann2 from solve the mystery custom level and map. great hint system. this is a story about jack frost ans how he became a spirit. you have to do three good deeds to get your "ball" charged to defeat the evil woman. some of the mini games i couldn't do but that is not unusual for me. sequel, i don't know. may be one. Rated 5 out of 5 by bsnbsn from Wonderful Christmas Story I knew the first story but there are 3 parts to this game. Call me a softy but this game actually tug at my heart strings. So glad I played it to the end. I shed a few tears. Rated 5 out of 5 by bessiegirl from Excellent game I have all the Christmas Stories in this series and always felt "The Nutcracker" was my favorite until now. What a totally wonderful, fun game. Graphics, voice overs, color and animations were beyond fantastic. Story was warm and beautiful and ending wraps up very well. 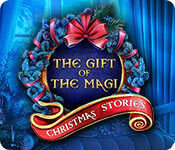 Totally enjoyed playing this game...wonderful Christmas story. HOS and puzzles were fun to play and not difficult and kept the game moving. Easy going enjoyable game to play. I found using the transporter hint to move around the game worked much better than dealing with the map. Game has an options tab so you can enhance the hint and skip to refresh quickly and eliminate the tutorial. Which is always a plus. This game is definitely a must to add to your game play. Can't say enough good things about it. Have fun! Rated 5 out of 5 by JulzCat from Another Heartwarming Christmas Story From Elephant Games I really look forward to these games every year. The roaring fireplaces, decorated trees, falling snow and lovely holiday music fills you up with a bit of Christmas magic each year. 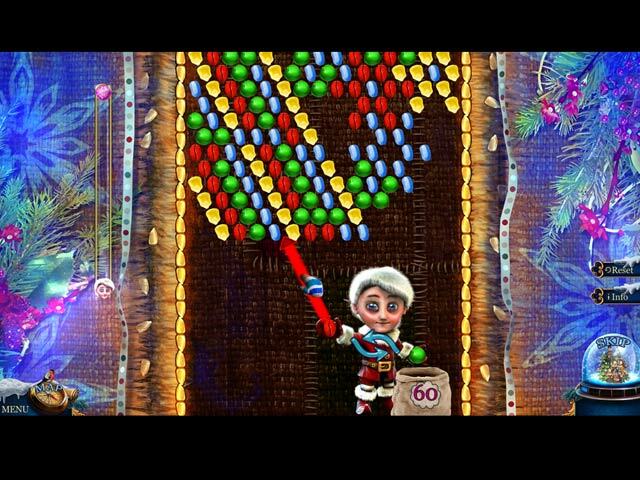 This time we get to do our "good deeds" with the help of Jack Frost and a cute, little elf. The box trolls are still up to their naughty ways, though! This game was a bit short compared to the others, but I still thoroughly enjoyed it. We play so many dark and gloomy games on here, it's nice to have a bit of cheer now and again. Rated 5 out of 5 by pennmom36 from One Good Deed Deserves Another On the first year of Christmas Stories, my Big Fish gave to me, The Nutcracker in a CE. On the second year of Christmas Stories, my Big Fish gave to me, A Christmas Carol in a CE. On the third year of Christmas Stories, my Big Fish gave to me, Hans Christian Andersen's Tin Soldier in a CE. On the fourth year of Christmas Stories, my Big Fish gave to me, Puss in Boots in a CE. This year the fifth year, my Big Fish gave to me, The Gift of the Magi in a CE! ....FIVE GOLDEN STARS.... four falling stars, three can't win, two just won't do, and one star goes on top of my tree! Christmas just isn't Christmas until Santa delivers a new Christmas Stories game on his sleigh led by Rudolph the Big Eared Elephant! The Gift of the Magi is another brilliant game adaptation that will assuredly get you in a Holly Jolly mood just in time for Christmas. Although this is a beautiful, whimsical Christmas Stories addition to the series, none of these games can hold a candle to the original, Christmas Stories: Nutcracker, but that's just my opinion. I also BELIEVE that the Nutcracker has more intense graphics than any of the others in this series. We can't deliver all this magic by ourselves folks, so Goody the Elf has agreed to lend his tiny hands so that Oliver can fill the Snowball of Good Deeds and save his sister Wendy. It looks like Wendy's actions put her on the naughty list, which summoned Berta, the evil spirit who punishes naughty kids! If not for the help of Jack Frost himself, Oliver may never have seen his sister again, so Jack has frozen time for a while, to give Oliver time to create Christmas miracles! I was a bit disappointed with the bling offered in the CE version, there aren't any hidden gift boxes to discover, collectible Santa's or Snowmen, no hidden Mistletoe. The possibilities are endless in a Christmas game like this, but instead, the devs chose 14 Morphing Christmas Gnomes, which aren't very appealing to Puss in Boot. There are also 36 Collectible Jigsaw Puzzle Pieces available in the CE, that will allow you to assemble three different puzzles and use as Screensavers, Bah Humbug! 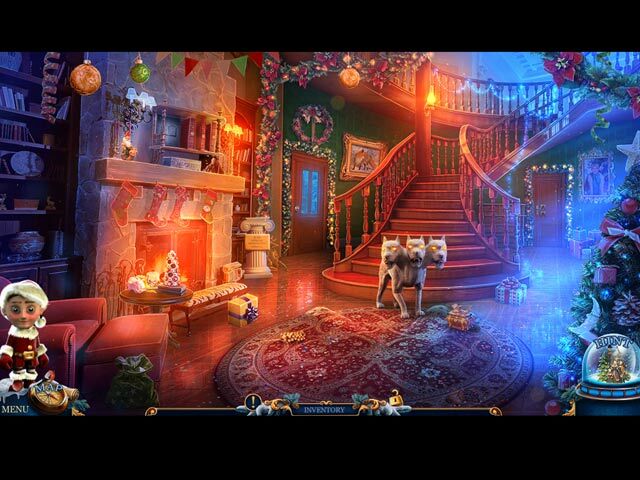 The Hidden Object Scenes are just okay, neither bad nor epic, but at least they are all Christmas themed. In the demo itself, there are Interactive List finds, and a scene where you open up two christmas presents at a time as you search for Matching Pairs. The Mini Games are exactly what you'd expect in a Christmas themed game. Below are brief descriptions of some of the games you'll encounter during the demo: 1) Swap berries on gingerbread men to reflect the same colored berry as on their bellies. 2) Use the clue to put the Santa and children behind the correct color coded gift bags. 3) Restore the photo by correctly placing the torn fragments into the frame. 4) Untangle the string of lights. (or just throw them away because nobody has the patience to untangle the Xmas lights!) The Collector's Edition has 5 Music Soundtracks, a Secret Room, 11 replayable Mini Games, 13 replayable Hidden Object Scenes, 14 Morphing Santa Gnomes, 36 Hidden Jigsaw Puzzle Pieces, 3 Screensavers, 14 Concept Art pictures, 14 Wallpapers, 22 Achievements, a built in Strategy Guide and a Bonus Chapter, ho ho ho, enjoy!